As you explore the foods of Spain, you will notice a lot of rice. It's included in many meals throughout the country, especially in and around the region of Valencia, which is famous for paella. 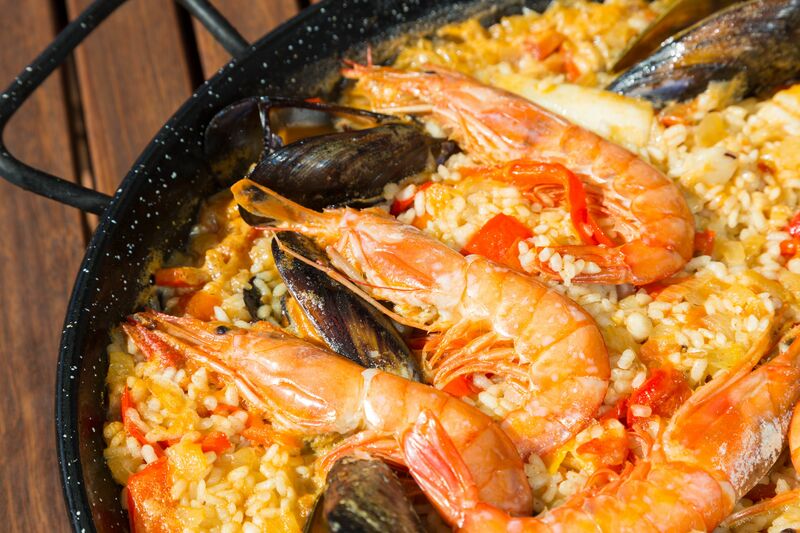 We have gathered the top and tastiest rice dishes from Spanish cuisine. They're all rather simple and each makes an excellent entrée for any dinner. There are as many versions of paella as there are cooks in Spain. This particular recipe combines chicken, pork, calamari, mussels, clams, and shrimp to create an unforgettable entrée. Paella Valenciana is the traditional version of Valencia’s signature rice dish. The recipe includes rabbit, chicken, and snails, along with a flavorful mix of garlic, onion, tomato, and saffron. If you don't like seafood, this original version of paella is the one for you. Additionally, you always can make it with chicken alone if rabbit and snails aren't appealing. Its versatility is the true beauty of paella. Switching gears from the elaborate to the simple, this main course can be prepared in a snap on any weeknight. Arroz Cubano requires just six ingredients and less than an hour of your time. As with any popular dish, every household has its own version. Some cooks prepare the rice with garlic, while others simply prepare white rice. Some open a can of tomato sauce and sauté it with a bit of olive oil, while others use a sofrito with onions and peppers. Arroz al horno is "Spanish baked rice" (horno means "oven") and it's another common dish from the rice-growing region of Valencia. In fact, it's so well-loved that one town in the area dedicates an entire festival to it. This is another easy dish that is perfect for any night of the week. It combines pork with morcilla (blood sausage), chickpeas, and garlic. The dish is finished off with fresh tomatoes and lightly fried potatoes, making it a hearty entrée for the family. Arroz con pollo (chicken and rice) is a standard main course in homes across Spain and Latin America. It is so popular because it is tasty, inexpensive, and easy to cook up. With a dish that is as widespread as this, you can imagine that there are many different versions. This recipe is a basic one, spiced with garlic, saffron, smoked paprika, and turmeric. It's a delicious way to introduce yourself to Spanish cooking. The Spanish eat almost as many beans as they do rice, so it's only natural that the two come together in alubias con arroz. This is a great dish for the fall and winter seasons and the beans are filled with nutrients, so it's a healthy choice. This meatless bean dish is simple and filled with flavor. You can use your favorite beans and you'll season them with garlic, bay leaf, onion, red pepper, and sweet Spanish paprika. When you add the rice, you have an entire meal in a single bowl.